The Wall Street Journal profiles Apple's "go-slow" approach to mobile payments. In June, Apple announced the inclusion of a feature called Passbook to iOS 6. Passbook allows users to keep loyalty cards, tickets and coupons in one central app. Passbook, however, does not offer a full payment system which has been a rumored area of research for Apple. Holding back in mobile payments was a deliberate strategy, the result of deep discussion last year. Some Apple engineers argued for a more-aggressive approach that would integrate payments more directly. But Apple executives chose the go-slow approach for now. An Apple spokeswoman declined to comment on the decision-making process. Apple's head of world-wide marketing, Phil Schiller, in an interview last month, said that digital-wallet mobile-payment services are "all fighting over their piece of the pie, and we aren't doing that." According to the Wall Street Journal's sources, a small group within Apple was reported to have been investigating a new service that would embed payment methods into the iPhone or even build a new payment network. Discussions reportedly included Apple facilitating payments with merchants and even all the way to the possibility of Apple to begin acting as a bank. Apple also considered simpler wallet app possibilities or working with existing middlemen and taking a small cut of each transaction. Meanwhile, the Apple iPhone team had indeed explored NFC communications options in the next iPhone. Various concerns included impact on battery life, security, vendor adoption and customer satisfaction. Ultimately, Passbook is said to be the current compromise while Apple presumably waits to see how the mobile payment market matures. “Innovation” doesn’t automatically mean rushing ahead into the latest buzzword, succeed or fail. Apple’s style of innovation is more focused on doing a thing right than doing it rushed. I'm actually glad to hear this. I want the next iPhone but am not yet comfortable with NFC technology. I'm sure there'd be an option to turn it off, but even so I'm a bit relieved they're not plunging in until more details have been ironed out. The problem isn't the technology, security or even Apple. The real issue is that most of the industrialized world has yet to agree on a standard for NFC payments. The Japanese and South Koreans have been using NFC contactless payment enabled cellphones since about 2005. There are no horror stories coming out of southeast Asia, so presumably they have implemented security correctly. 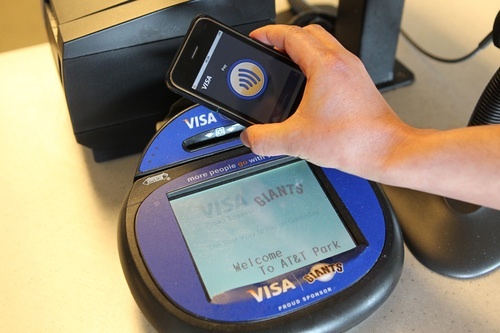 RFID and NFC payment systems have been around for quite a while here in the United States, but they are pretty limited. Most of the major public transit systems in large metropolitan areas have NFC rider cards. Here in the SF Bay Area, it's the Clipper Card which covers eight transit agencies. Additionally, there is FasTrak which is a statewide toll payment system; here in the Bay Area it mostly covers bridge tolls, however there are some express lane tolls it covers, both here in the SF Bay Area as well as Southern California. Many credit card terminals in retail stores are also enabled for NFC contactless payments. Chase issues both Visa and Mastercard credit cards with PayPass NFC technology. Although no one uses it though. It would be wonderful if my next phone could be used as a transit pass, it would remove one card from my wallet. That's actually how the "osaifu keitai" (literally "wallet phone") became popular in Japan; it acted as a Mobile Suica card for JR East, the biggest rail operator in metropolitan Tokyo. Any hesitation by Americans about such a system is unfamiliarity or ignorance, not a problem with the technology which has been heavily used in a consumer environment for many years. This is HIGHLY disappointing. Japan and other nations have been using NFC systems for a long time; vending machines, pay stations/check-outs, airlines - all used through NFC tech. If Apple is simply using an app that requires a barcode to be scanned as currently implemented this would be disappointing (many companies do not own the proper scanners). Again, the problem lies with the lack of multi-national standard. American Express has recently removed NFC chips from their Blue credit card. My old one had the chip, the one recently issued does not. In Japan, basically NTT DoCoMo said, "here is our system, end of discussion." Most readers here aren't really familiar with NTT DoCoMo, but they are *the* dominant mobile operator and were pretty close to being a monopoly for many years. I should be pointed out that using the iPhone has a scannable electronic pass is not new. Several US-based airlines offer mobile boarding passes (I used this on American Airlines a couple of weeks ago). This is an example of when typical competition between corporations actually does not help the consumer. We are years behind the Japanese (who introduced the wallet-phone in 2005) because dozens of companies are working on their own systems to hopefully grab a larger piece of the pie. Meanwhile, there is virtually no adoption since no merchant wants to invest heavily in a losing horse. Undoubtedly American Express has invested millions in their now-dead NFC technology as well as their previous smart-chip card technology (I had one of those USB Blue Readers -- it provided zero benefits to me). I don't think they're not trying to be innovative... it's just that everyone's trying to do their own thing and to jump into such a balkanized market isn't in the best interest of Apple and their customers. Why try to start a NFC and have no stores try to adopt it because they already tried Google Wallet, or whatever? Apple didn't add what "I" think is important so I'm going to throw a tantrum. It would not surprise me in the least, if Apple became involved as an integral part of the payment system. They've got legions of believers that trust them more than they trust other entities. Apple would get a cut, just like the credit card companies do now, and it would result in one more massive income stream for them. This seems the most likely scenario for holding back. Apple has demonstrated time and again that they want a cut of anything their devices do. Moreover, if history repeats itself, they'll also want everyone tied to the Apple payment system with no other choice. Actually, NFC dos not really belong on credit cards. That's where the security risk is the greatest, because credit cards are dumb tags, without any security controls. On a phone (referencing Google Wallet), you not only control when and for how long the NFC signal is broadcast, but the phone keeps a record of the transaction, the data is encrypted, and no physical evidence of account numbers is exposed during the transaction (as it could be by bringing out a card to wave over the sensor). This means that it is significantly harder to steal financial over NFC from a phone than it is from a card. The idea that anyone should get a cut is disgusting. Apple should make their money from selling technology. Banks should make their money from lending the money deposited with them by savers. This middle-man 'skimming' of money for nothing is endemic and represents everything that is wrong with business these days. Why the hell should anyone profit from the fact that I spend my own money? And don't argue it costs money to provide the facilty to spend it: you'd be outraged if every time you spent cash in a shop you received a bill from your bank a week later. Not so. A lot of people have email and/or sms notifications for charges to their credit cards, the moment said John Doe goes for a transaction you are notified and you block it. People can hack anything these days though, hacking into disabling remote wipe should be a piece of cake for any crook worth their salt, I am sure hacking tools like that will be readily available in the underworld. Of course the notification scenario works here too, which only comes to prove that credit cards are not any less protected than nfc, if the ultimate means of protection is someone informing you quickly of illegal activity. They got a hell of a lot of issues to solve to make nfc really secure. As the feds say anything on a network, assume it isn't secure. I am one of those with an instant email once my card is charged more than .01 cent. I am also one of those people walking around with NFC enabled credit cards. And I am not getting one of those as seen on TV faraday cage wallets. Risk is everywhere. It's the world we live in. I'm enjoying my Google Wallet world, personally. Livin' on the edge! Also, NEAR Field Communication. If I see some shady dude 3" from my phone with some scanning device, it will be readily obvious he's trying to hack me. All I need to know. Lastly, I load up Google Wallet with a pre-determined amount (similar to a gift card). If it has $4.53 on it, then the hacker can enjoy a Big Mac on my behalf. Go nuts man.